Richard van der Maden is the business advisor of December for the Small Farmers, Big Deal – campaign! 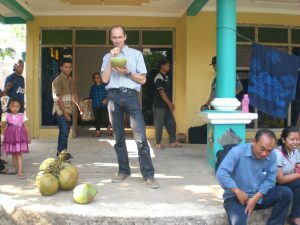 This week he tells how Agriterra can help to set up a business deal with a farmer cooperative in a developing country. Richard: “For instance; we’re currently working on a business deal for MAAS, a Dutch coffee machine business. Indonesia can provide many types of sugar; palm sugar and coconut sugar are examples. My role in this matter is of an intermediary: I know which of farmer cooperative clients can produce the quality and amount of sugar asked. For a company like MAAS it would probably be impossible to arrange a business deal on their own. Agriterra has got the lay of the land, and also knows the language and cultural norms. Agriterra works with these local sugar cooperatives to prepare them for doing business with companies like MAAS. Many international partners have more stringent demands and standards than Indonesian trading partners. We coach and guide the cooperatives on how to improve their commodities and practices to obtain the necessary certifications. “How does a business deal with a farmer cooperative work? Well, if a Dutch company is interested in finding new primary sourcing partners, the first step would be to get in touch with our Dutch office. We would discuss what kind of commodities the company is looking for and the amount and quality needed. Maybe there are also specific countries in which the company is interested in. We get in touch with our local teams to check our network and availability. If we find a potential partner, we usually arrange a business trip. It is extremely important that a Dutch company goes on the ground to get a sense of what the company and market situation locally is. We facilitate and plan these business trips. Next week, Richard will share some background and tips on doing business in Indonesia.